The DC Rebirth brought the Justice League of China, and now an army of Chinese Green Lanterns are next. Most casual superhero fans may be used to the idea of Chinese knockoffs of American superhero tropes or designs, mainly conducted without legal or corporate consent. 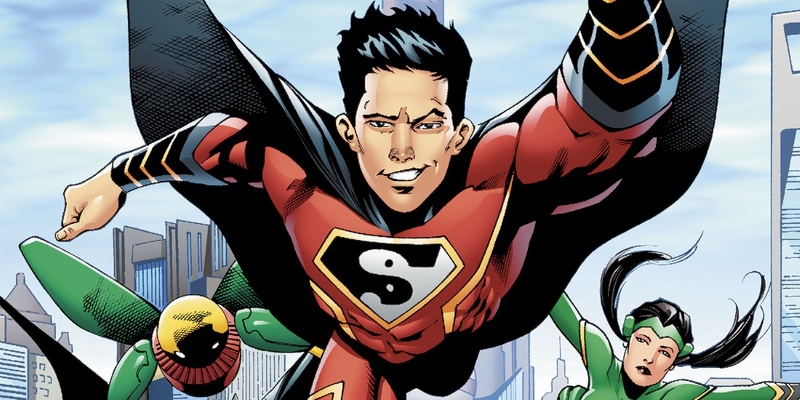 But that was the exact assumption that Gene Luen Yang used to shape his New Super-Man when the series joined DC's Rebirth, placing the young boy Kenan Kong as the lucky test subject to receive state-sanctioned superpowers. In almost twenty issues since, the arrival of a Chinese Batman and Wonder Woman has changed the complexion of the series (and Kenan as a hero) significantly. With Issue #20 the series will officially be changing its name to New Super-Man and the Justice League of China, with Chinese variations of Supes, Bats, Wonder Woman, Robinbot and Flash going independent in their protection of Southeast Asia. Not ones to let a setback like this stop their progress, the government agency that created this new League is already on to their next generation of heroes. It's the bombshell dropped in New Super-Man #18, after a string of them in previous issues. For those who may have missed out on Kenan's latest evolution, it comes with acceptance that he is more than just a superhero - he's the figure charged with balancing Yin and Yang (a clever realization that allows him to absorb his nemesis, All-Yang, embodiment of strength and aggression). The acceptance of this greater role had an obvious result - replacing the 'S' on Kenan's chest with a Yin-and-Yang equivalent - and a larger one. The time for Kenan to follow orders from his government masters is over. He, like his fellow Leaguers, must answer a higher calling on a more global scale. Relying on Bat-Man to give them a window to escape, the Justice League of China begins its new age in the DC Universe. While the Ministry of Self-Reliance concedes their defection as proof that a "corps" was always the wiser choice. Aside from the obvious questions - what power will these Chinese Lanterns wield? Will their responsibilities be cosmic in scale, not just global? Are they chosen for the same reasons as their Oan counterparts? - Yang's latest twist suggests his story is far from over, and extends well beyond a Chinese 'copy' of America's superheroes. From the start, the series was sold and succeeded on the idea that heroes like Superman, Batman, and Wonder Woman mean something different to an Eastern audience, or would display different interpretations of the same core ideals. So what does that mean when it's the intergalactic peacekeeping force of DC's galaxy getting the same treatment? The possibilities really are endless, since the actual values, beliefs, and function of the Green Lantern corps has varied with each creative team and reboot. The odds suggest these Chinese Corpsmen and women will keep their attention on Earth (China, specifically) to begin with. And as alluded to above, it's unclear how much power they may possess or channel, and if leaving the planet is even a possibility. Fans can find whatever answers the Justice League of of China team are willing to offer in Issue #20, beginning the team's title run in February 2018. New Super-Man #18 is available now.